You hear about good finds on craigslist every once and a while but rarely do you find not only a car that by all accounts is rare, but one with a particularly interesting provenance. A local racer here in Northern Michigan, who has been competing on track for decades found his first Bocar several years ago. At the time he didn’t really know much (like many people) about a Bocar except that it was a unique and interesting kit car/racer from the 50’s, made in Colorado. It was also eligible for vintage road rallies and races which made it all the more usable. Bob Carnes out of Colorado founded Bocar in the late 1950’s. They promised safety, daily driving, go racing on Sunday and then drive home without any alterations - a racer for the road. Sound familiar? The cars were built to the driver’s specs with a mid-front Fuel Injected Chevrolet V-8, brakes off a Buick, and a custom front end belonging to a Porsche 356. They were looking at 300 - 500hp and depending on the gearing were good for a wild and crazy top speed of 200mph, supposedly, and a 0-60 time of 4.5 seconds. Keep in mind this was in 1958 so those are some pretty impressive numbers. The cars were very aerodynamic, not bad for an aeronautical engineer. Go figure. Not very many Bocars really exist and today there’s probably less than 20 tops (probably less), it’s hard to say. It would be accurate to say that you don’t come across one very often. Harry Heurer and occasionally Augie Pabst ran one of the more famous Bocar’s. 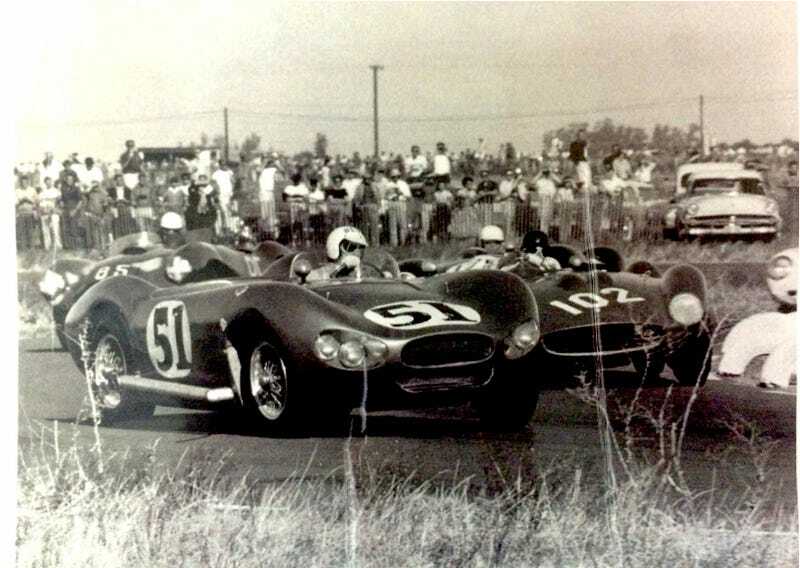 It was purchased in Colorado by Harry, driven back to Chicago and raced that weekend. After his picture appeared in the morning paper for helping another driver to safety after a nasty crash, the bank realized what exactly that loan was for and decided racing wasn’t really their thing. Luckily Harry was very involved in that business we all know and love dearly, beer. Corporate sponsors of race cars hadn’t quite caught on yet but with a “who needs em” to the bank, the blue and white Meister Brauser team was established. Beginning with the Bocar, and then more famously Scarabs from Southern California. On a side note… yes, more beer. Meister Brauser, one of the first light beers, would go on to be sold to a certain Milwaukee based firm, and is now commonly referred to as Miller Lite. Augie Pabst even put the Bocar on pole at the Bahamas Speed Week only to suffer mechanical issues in the race. So why all of this information? Because the first blue and white Bocar, the Meister Brauser III, was found… yup you guessed it, on craigslist. A friend of the collector (as you can imagine the Bocar community is pretty limited) sent a post of another Bocar for sale and while it clearly looked like a Bocar, it was a little different. It was mostly the larger and stubbier grille that gave it away. It had a grey/blue paint job and at first they thought maybe it was just a cool kit car someone made themselves, and then they noticed a couple other peculiarities. There was a little inlet near the floor on the drivers side that fed air into the foot well to cool the driver’s feet, as well as the entire front end which could be removed which meant it had to be the Meister Brauser car or at least mostly had to be. Needless to say the car was purchased and while sanding down the paint to see exactly what was going on, the blue and white came through and then the original baby blue from when it was purchased. Must have been quite a feeling and a sigh of relief to see those original colors come through. The car underwent an extensive restoration and is now put very simply, stunning. From the rope on the steering wheel, to the gauges, to the lettering, engine, wheels, where ever you look, it’s really impressive. The car is being shown at car shows across the Mid-West and has even been reunited with it’s original drivers.